If you’re after a modern bathroom design that still has some personality and reflects your individual tastes and style, it can be difficult to know what and where to start! When we think of ‘modern design’ we think bright white, simplistic line and shapes, and a distinct minimalist vibe. We’ve written this blog to give you a helping hand, let you know what’s in at the moment and hopefully give you some modern bathroom inspirations. Smoothly rounded curves are really in right now. Investing in some curvy bathroom furniture will give your bathroom a modern appearance that’s a little more interesting that straight lines. An extra added bonus it that curves are a lot easier to clean! As there are no corners for dirt and grime to get trapped in, you will be able to whisk around your bathroom in no time at all! 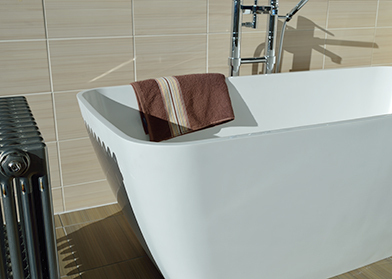 People often think that Modern Bathrooms have to be bare and plain, but we disagree! You probably spent a lot of time buying soft furnishings to make the rest of your home look fabulous, so why would your bathroom be any different? For a traditional addition to a modern bathroom, why not try hanging an ornamental chandelier, or try and use ornate picture frames? This can add a luxurious, old-fashioned and glamorous feel to your sleek and modern bathroom. To prevent your modern bathroom design lacking personality, we recommend adding bold splashes of colour. The brighter the better for your accent colour – try lime green, vibrant teal and zingy cerise – as they are all big this season! Wood features are must-have at the moment, adding a warm and welcoming modern bathroom. Be sure to get the right, treated, wood as a peeling, rotting bathroom is less than ideal! Updating your light fittings and investing in a flashy new shade can make a huge improvement to your bathroom. A good quality mirror can make all the in a modern bathroom. A good quality new mirror to can really bring a bathroom to life! These are just a few tips we have, but if you pop into our store, our knowledgeable and passionate staff can give you plenty more ideas! We are dedicated to providing beautiful, unique and personal bathrooms, so let us help you. You will find us here, or give as call on 01623 515793.